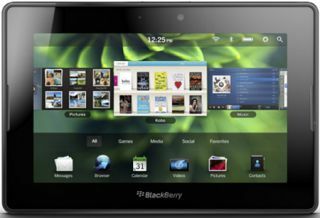 BlackBerry updates PlayBook Tablet, adds email client, Android apps | What Hi-Fi? BlackBerry has released an update for its PlayBook Tablet, bringing new features including an email client and support for some Android apps. The free OS 2.0 update is available now via a wireless download and adds plenty of new features, many of which should probably have been on the PlayBook from the start. Alongside the email client and support for selected Android apps is a new calendar app and a contacts app. There are improvements to video chat, the virtual keyboard and the BlackBerry Bridge features. Head to the BlackBerry PlayBook website and click on 'latest software release details' for more information.